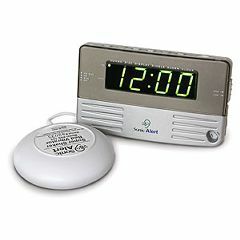 With the Travel Size Bedside Sonic Boom Alarm Clock, you'll be sure to wake up on time! The New Sonic Boom SB200ss is a cost effective travel & bedside alarm clock, with a large easy to read display and bed shaker. Complete with a hi/low dimmer switch to sleep better at night. Packaged with the newest most powerful 12-volt bed shaker. Complete with a loud 113db adjustable tone & volume control. Battery backup to maintain the proper time in the event of a power outage. Snooze - Repeats every 9 minutes. Clock measures 3-3/4" x 6". Shaker measures 3-3/4" x 1-1/4". Shaker cord length is 6 feet. Alarm duration is 59 minutes. Dual Power and Dual Time features: The SB200ss clock has a 110 volt power supply, and will work with 220 volt transformers. The clock also has two switches; one allowing users to switch from 50Hz 100 volts to 60Hz 220 volts. This feature keeps proper time with 110 or 220 volts. Another switch allows users to select 12/4 hour time. Flimsy. difficult to turn off. . This is the third clock I have had from this company in two years. The first lasted about a year and a half. The second one had a defective bed-shaker. This one is not as loud as the first one and I'm not sure it would wake me up if I were really asleep. The alarm is too soft. The bed-shaker works. We'll see how long it lasts. I have my doubts. Used most often when traveling for business and can't miss getting up for a flight, meeting, etc. I would like to be able to turn the vibration down a bit but that is not an option. Other than that, it works well. Great if you wear earplugs to sleep!! As a silent alarm clock. The unit is a bit flimsy/light weight and moves around on my night table when the shaker unit vibrates, I put a piece of non skid rug pad under it and it has helped somewhat.